City Council amendments to CC2035 Plan could put Chinatown's historic designation at risk. The New Chinatown-Japantown Historic District (in Old Town) could be poised to lose its nationally-recognized historical designation after City Council amendments make way for new developments in the district — against recommendations from various government bureaus, committees and offices. The City Council voted 3 to 2 on May 23 to increase the height to 200 feet on four and a half blocks in north New Chinatown-Japantown from a previously approved bonus height of 160. This amendment included Block 33 and four blocks in the northern part of the district near the Lan Su Chinese Garden — for which there will be a shadow impact study, in an additional amendment identified by City staff. The four newly heightened blocks are located between Northwest Everett and Glisan Streets, and Third and Fifth Avenues. While the new heights are actually lower than what current code allows, it's an increase from the original Central City 2035 Plan that is setting up the skyline's future — a project that's been in the works for three years. The discrepancy has historical preservationists and downtown developers up in arms. While this is good news for downtown developers trying to bring additional housing to market, historical preservationists disagree with the necessity for extra height — although they do support developing additional housing, retail and restaurants in the district. The State Historic Preservation Office wrote a letter to the City Council saying increased heights could potentially threaten the listing of the district as historic in a general sense — not specifically mentioning Chinatown. The letter said that materials and detailing aren't enough to mitigate incompatible heights. "The overwhelming mass of substantially larger structures adversely affects a district's historic integrity, or historic appearance, by replacing historic buildings and spaces with new construction and introducing visual impacts throughout the district that negatively affect a district's setting, feeling, association and design. Such impacts may result in a district losing so much of its historic character that it no longer qualifies for a listing in the National Register, or for the associated state and federal tax benefit and grant programs," stated the office's letter written by Ian Johnson, associate deputy state historic preservation officer dated March 22. The Historic Landmarks Commission also submitted a letter expressing great concern for increased heights in the fragile district. 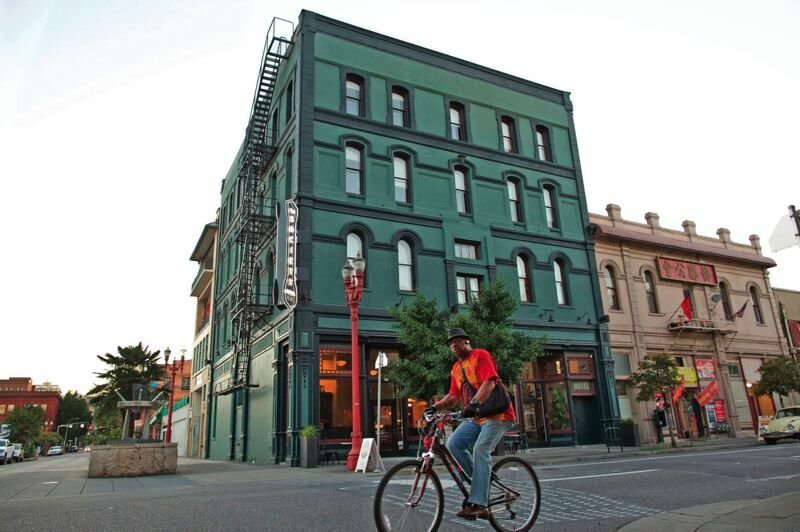 As Portland's only district officially recognized for its nonwhite ethnic history, the Landmarks Commission fears it could be de-listed from the national register, and the city would have failed at protecting its historic resources. "The rush to arbitrarily spot-zone a single block to benefit a single developer not only raises many questions about equal treatment of other similarly situated owners throughout Central City, especially those owners who have invested in the neighborhood's historic resources without this handout; but also raises serious questions about transparency and arbitrary decision-making," read the HLC open letter to the City Council, dated May 22. To be on the list, the district has to have at least 50 percent of its buildings considered contributing historical resources. Nationwide, individual landmarks have been de-listed before due to incompatible nearby developments. The City spent $170,000 on the recent process of adopting new guidelines for New Chinatown/Japantown to protect it, as part of the Central City 2035 Plan — guidelines that were overruled by the City Council's recent amendment. If more developers continue to push the limits against bureau and commission recommendations, and the City Council continues to approve it, New Chinatown/Japantown could be de-listed as a state historic district. "One of the property owners who owns some of the land, a couple of the blocks and the northern blocks, he had been lobbying for higher heights there since the beginning of the Central City 2035 Plan," said Hillary Adam, with the Bureau of Development Services (BDS). "It's still currently a 350-foot maximum height, but because the comprehensive plan says that the City's basically supposed to right-size the development standards in the historic district, the BPS (Bureau of Planning and Sustainability) opposed reducing the heights up there on the northern four blocks." The drama has been drawn out over the past few years, while the CC2035 Plan has been put together. "At one point actually, the City Council voted on this whole concept and seemingly had put it to bed," Adam said. 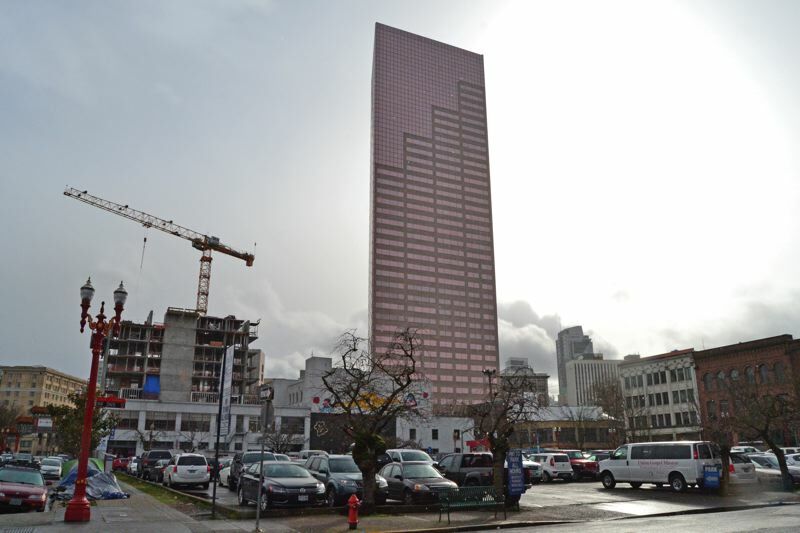 "They discussed it at that time and also took a vote on it, and settled on only increasing the west half of Block 33 to 160 (feet of height) at that time." 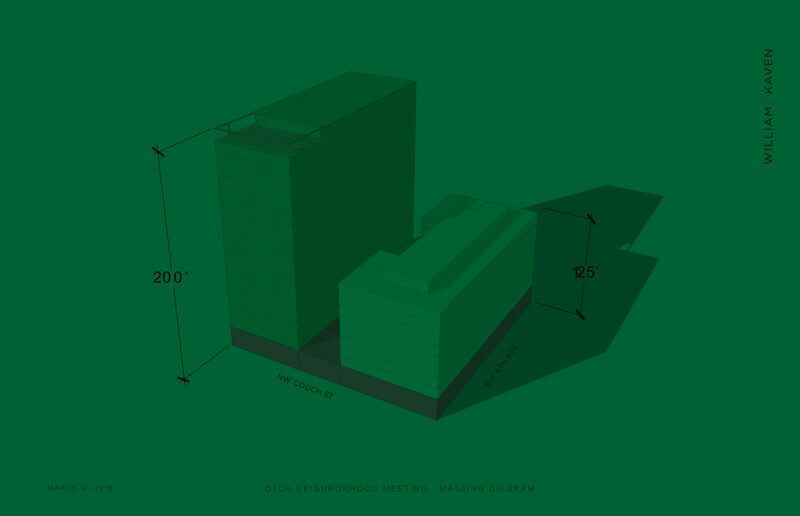 Then, two weeks ago, commissioner Saltzman proposed an amendment to increase the height on the northern four blocks to match the new height at Block 33. "So last week was a bit of a surprise, introducing this new amendment and increasing the heights on the northern four blocks as well," Adam said. The heights in the district are currently allowed to be 350 feet maximum (a 1988 adoption intended for skyscrapers), and the CC2035 Plan initially recommended a 125-foot height limit. New developments need to aim to meet the new CC2035 requirements. There was some going back and forth up to 200 feet before the final vote settled at 160 — or so it had seemed. "We're just really dismayed," said neighborhood stakeholder Lynn Fuchigami Parks, executive director of the Oregon Nikkei Legacy Center. "The next thing happened very quickly. All of a sudden, there's a new amendment that came up with no public process that included an additional four blocks that would go to 200 feet. Not very many people were aware of it. There was not, in any of the meetings I went to, anybody in favor of raising those kinds of heights in this district — and it happened boom, just like that." She said the heights are not compatible with the character of the surrounding buildings, and could threaten the viability of the Lan Su Chinese Garden with shade. "All the recommendations came out of these specific public processes that took place to get community input, expert input, they created a special advisory council. There were many, many people involved in this, many community members and voices involved, and this happened just in the blink of an eye," Parks said. The difficulties involved in building something new in the historic district leave it up to only the firms that can afford it. 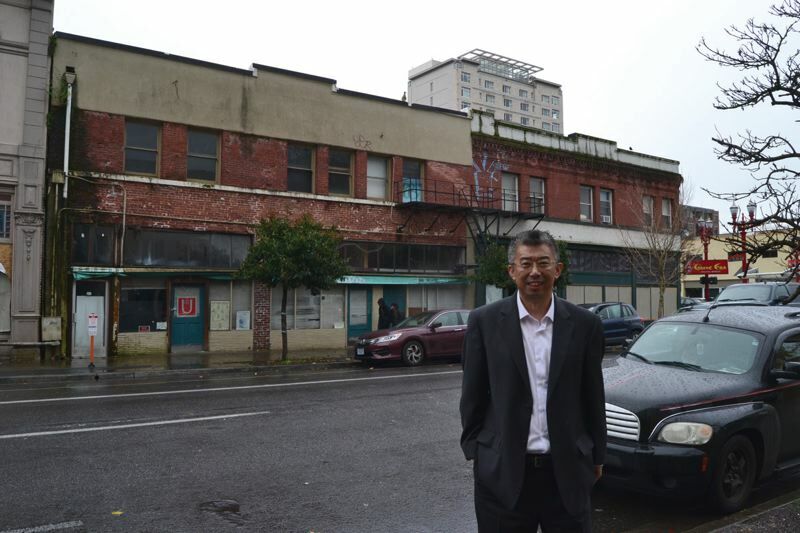 As for smaller developers like community leader Hongcheng Zhao, he was not able to move forward with redeveloping the unusable, unreinforced masonry Wong Laundry (219 N.W. Third Ave.) because it would be too expensive to seismically retrofit, and he wasn't able to obtain a demolition permit because of the historical value. "I do feel yes, housing of course has been a big demand and big topic. The frustrating part was why do you need 200 feet to achieve that on Block 33? That 160 feet was the compromise," Parks said. "You see other historic districts and what they've been able to do with still being respectful of the existing character, but add retail and restaurants and all the things that really make a neighborhood desirable where people want to come and live. Many of us truly believe that this can happen and you don't need to build a 200-foot building to have that happen." The BPS completed its work sessions on the CC2035, forwarding their recommendations to City Council on May 23, 2017. The City Council began hearings in September 2017, and City Council review and amendments began this May. They're expected to take a final vote by June 6, with the CC2035 expected to take effect on July 9, 2018. Parks commemorates the days when a dozen blocks in Old Town made up Japantown in the late 1890s and early 1900s. "It all disappeared overnight basically with an executive order, when everyone was forcibly removed," she said. The Nikkei Legacy Center runs the Oregon Nikkei Legacy Museum along Second Avenue and the Japanese American Historical Plaza also known as the Bill of Rights Memorial along Burnside. The plaza was dedicated in 1990, about the same time the Legacy Center began to have a real presence in the Old Town neighborhood. "Personally, I've been in the neighborhood for 40-plus years. My mother had an educational toy store here in this same building, the Merchant Hotel, in the late '70s," Parks said. "We're here because there's not much left of what was Japantown." According to a letter she submitted as testimony to the Oregon State Legislature in 2017, her grandparents were incarcerated in Colorado and lost their 20-acre farm and house in California. They were given five days to sell what they could, and pack up what they could carry. After years of back-breaking work, when the war ended they were given $25 each to try to restart their lives. "The character of the neighborhood still exists very much like it did when it was Japantown," Parks said. The City took three years to put together the Central City 2035 Plan, which included the New Chinatown-Japantown guidelines. As for development in Chinatown-Japantown, there is a right way to do it, according to Parks. "We absolutely want revitalization and development here ... All of us in the neighborhood support revitalization and development in the neighborhood, but we really feel that it can be done mindfully and respectfully," Parks said. "You can look at examples all across the country: cities have been able to successfully preserve, revitalize, reinvest in historic districts to restore them to vital neighborhoods to attract tourists, residents, and they do this without destroying its existing integrity." She brought up the University of Oregon's expansion into the new 38 Davis building, the Society Hotel's renovation, the Oregon College of Oriental Medicine and the new Portland Chinatown History Foundation Museum opening this summer. "We want the City to be supportive of those kinds of projects, because as we testified for that 2035 Plan, there's verbiage that talks about this Old Town being recognized for culture and history," Parks said. "The latest passage of this amendment is just totally not respectful of that."